In the 1950s, the movement for civil rights had gained serious momentum, shaking the system of Jim Crow white supremacy to its core and provoking a vicious response from its supporters. The most notorious group that fought to defend segregation was the Ku Klux Klan. In North Carolina and South Carolina, the Klan operated under the leadership of Grand Dragon James ‘Catfish’ Cole, initiating a campaign of terror that included killings, threats, and cross-burnings to intimidate Black people across many counties and towns. In addition to targeting activists and “trouble-makers,” interracial couples were treated in a similar manner. The Klan had long functioned as a paramilitary force to police and enforce the south’s strict racial codes. Attacking individual violators was a favored method to demonstrate their capacity for violence, to portray themselves as “defenders of the white race” and to prevent larger political challenges to Jim Crow— in short, to keep everyone in their place. In October 1957, the Klan had already suffered a demoralizing blow at the hands of the heroic Black self-defense squads led by Robert F. Williams in Monroe County. Flexing their muscle against the Lumbee was not just about an individual couple, but part of Cole’s effort to showcase and rebuild the Klan’s strength in order to push back the growing Black freedom movement. Instead of intimidating the Lumbee people, however, the Klan met a determined and armed force that drove them out of the area. 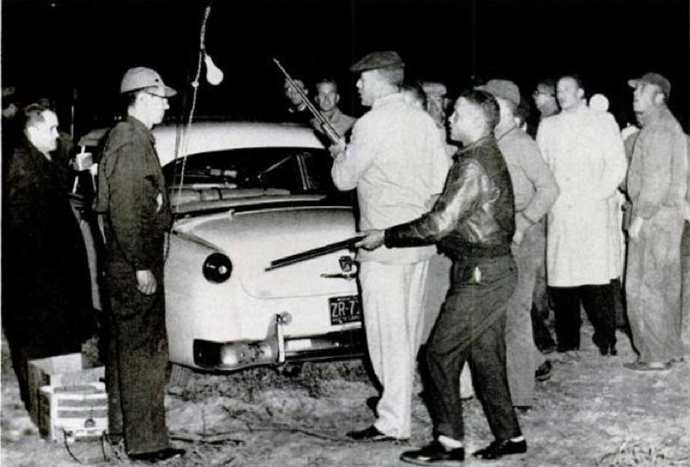 On Jan. 18, 1958 Cole scheduled a Ku Klux Klan demonstration near the Lumbee town of Maxton, North Carolina. To Cole, the success of this rally was crucial to his continued leadership of the Klan in the Carolinas, given their defeat in Monroe County. 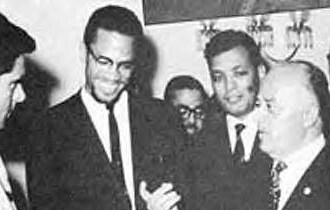 From the beginning, the sheriff of Maxton, Malcolm McLeod advised James Cole that his life would be in danger if he executed the rally. The sheriff was not opposed to the disgusting message of Cole’s demonstration, but concerned for his safety. The rally was met by a large, disciplined force of armed Lumbee people willing to defend their dignity and self-determination. Cole envisioned an audience of thousands of sympathizers but was received by no more than fifty racists, compared to five hundred Lumbee who encircled the demonstration. The anti-Klan force destroyed Cole’s amplifier, signaling the beginning of the offensive. The Lumbee charged and opened fire. The racists were quickly overwhelmed and panicked, fleeing Robeson County. Cole ran away towards the swamp of Hayes Pond, after which the battle is named, leaving his wife behind in the fray. The Sheriff positioned two plain clothes police officers in the demonstration, who fired tear gas to protect the racists. The Lumbee dispersed, but not before driving out the Klan. The Lumbee victory proved to be the fatal blow to Catfish Cole’s career as a white supremacist leader. The Klan would not have any presence in Robeson County for decades following their defeat. Catfish Cole, having become a liability to the local ruling class for suffering defeats in both Monroe and Robeson counties, was prosecuted and jailed for inciting a riot. The legacy of the militant Lumbee community is carried on today by other Indigenous people struggling against similar racist organizations. In North Dakota, white racist groups are seeking to take over the tiny town of Leith, but were dealt a blow when a largely Native demonstration disrupted their organizing efforts. 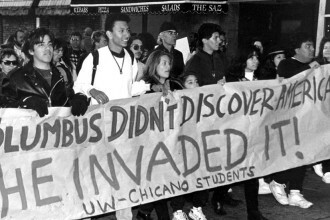 The Lumbee victory at the Battle of Hayes Pond, obscured from most textbooks, remains a model for all oppressed people who desire to fight back—and proof that victory is possible.